Back in 2012 I blogged about a self-imposed budget challenge where I lived on $20 per week for ALL MY EXPENSES. Groceries, gas, entertainment, dining, unexpected emergencies..
Obviously it didn't include things that we paid regularly (like rent, utilities, school fees) but it included anything I would normally pay cash for (or put on a credit card). So if I could make a choice to buy it, I could only spend $20 per week on it: Restaurants, gasoline, groceries, cleaning supplies, toiletries, haircuts, birthday parties, gifts, clothes, coffee. It was a tough challenge, and I actually had to come up with ways to supplement my budget (cashing in aluminum cans, bartering for free meals etc.) At the end of four weeks I had learned A LOT and I ended up saving quite a bit of money. We saved nearly $2000 that month.. although I did end up spending about $200 re-stocking the pantry.. but we were still had enough money to pay for a Disney trip. I also did a LOT of budget cooking and working with the staples that I had in the pantry. That alone was the biggest source of savings; not eating out. It has been five years since that challenge ended, and I decided I am finally brave enough to try it again. I am going to see if I can only spend $100 FOR THE ENTIRE MONTH. Keep in mind, the goal of this challenge is not to see if someone could actually survive on $25 FOREVER (spoiler.. you couldn't). What I am trying to do is figure if I had to stop spending money cold turkey, how long could I stretch it? How flexible could I be? How much of our monthly expenses are things we could live without or at least put off? I want to be more aware of where our ‘disposable’ income really goes. The “rules” for the challenge will be basically the same as last time. - Charitable donations will not be included. - Medical expenses will not be included. - I will not use cash alternatives (Gift Cards, store credit etc) UNLESS I do something to specifically earn them for the challenge that I wouldn’t normally do. (Bartering, having a yard sale, secret shopping in exchange for a free meal). 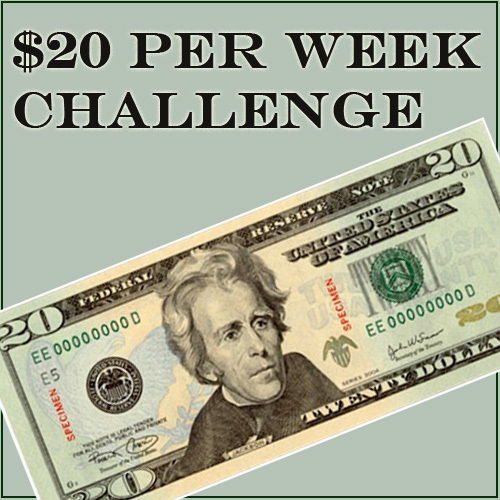 - Any of the $25 I don't use during the week rolls over to the following week. - All the food in my pantry and freezer is part of the challenge. The goal isn’t to buy everything with the $25 but to see how long I could go in my current situation on only $25. At the end of the challenge I’ll summarize my experience and compare it to my last attempt. It should be interesting now that I have done this before, knowing what I know from last time, to see if it is easier. The challenge starts TODAY! Fingers crossed!